NEW ONLINE MYSTERY CLASS TO START SOON! 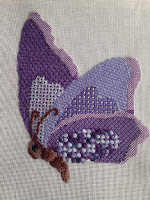 It is hard to believe that it will soon be time to post the first lesson for the Beijing Butterflies an exclusive design by Leigh Designs for Duo Designs, Inc. Online Mystery Classes! This elegant design has 3 lovely butterflies winging around a circle. We will be doing or nue`variation, needle weaving, ribbon embroidery, thread painting, split stitch, buttonholes, bullions, satin stitches, open stitches, and, of course, adding crystals and beads! We'll use great silks, metallics, shiny ribbons, cottons and more, including some threads with which you may not be familiar! What more could you want in a project? This project covers 6 months and the first lesson will be posted mid-August. Registration is currently open! So if you want to join us just send an email to register to duodesignsinc@yahoo.com and say 'I want to play too!' We'd love to have you. 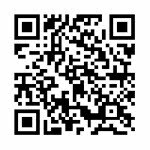 Scroll down through some earlier postings to get all the details! Be sure to follow this blog to keep current on the new and exciting Online Mystery Classes we have in store for you. More details will be shared around the first of August. But for now, remember, stitch with a smile~! TO KNOT OR NOT TO KNOT! It almost always happens in every class - a student will ask how to begin and end a thread. The answer is that it depends. My most commonly used method is what I call an away waste knot. This is where I place a knot in the end of my thread and take the thread to the back of the canvas with the knot resting on the top. Now I call it an away waste knot because I want it placed 'away' from the stitching area. I also want it far enough 'away' that when I am finished stitching I can cut the knot and the thread will be long enough to thread in a needle and work through my other threads on the back thus securing the beginning end of the thread. I have another technique that I call the inline waste knot. 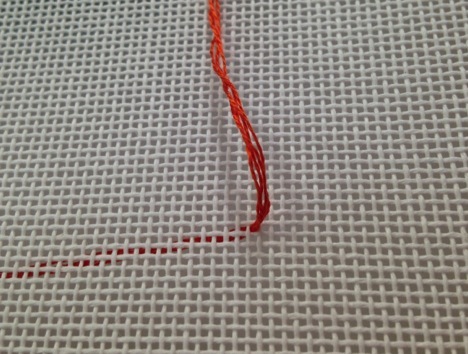 Again I place a knot in the end of my thread and take the thread to the back of the canvas with the knot resting on the top. In this instance, however, I know that I am going to have a line of stitching (say a horizontal line of several stitches). 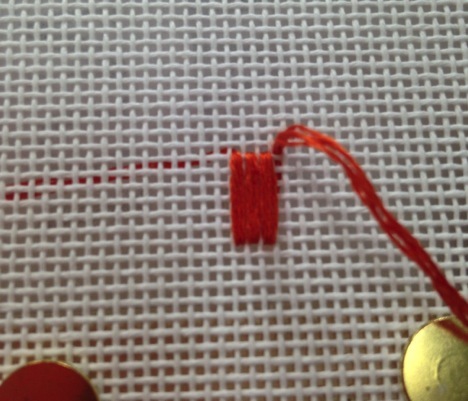 So I place the knot at the opposite end of where I will begin stitching about a couple of inches or so away. 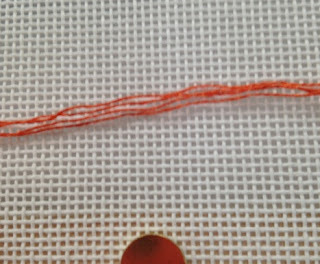 Now when I stitch, the back of my thread will be wrapping around and securing the beginning thread that is lying in the path of my stitching - or inline with my stitching. When I get to the knot I simply clip it off and continue on my way. 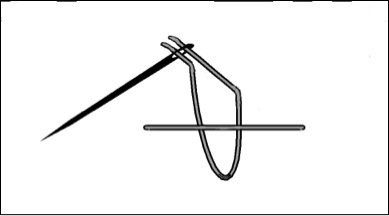 The advantage of beginning this way is that the stitches do not need to be disturbed in order to work the thread end on the back by weaving in and out to secure the beginning end. 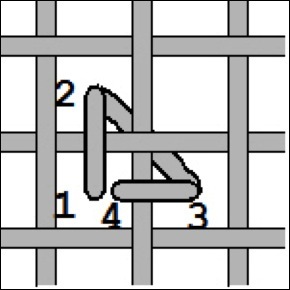 Another method used to secure the thread is a pin stitch also called an L stitch. 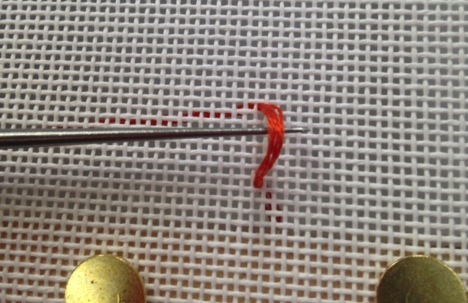 Another method I am aware of requires the used of at least 2 strands of thread. Well, actually one strand but you double it thus making it 2 strands for stitching. 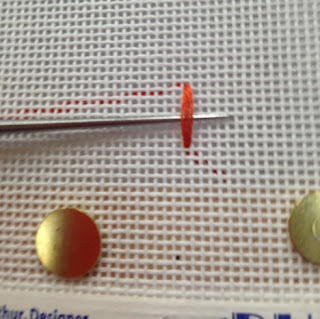 With this method you thread the needle with both cut ends of the thread thus creating a loop at the bottom. 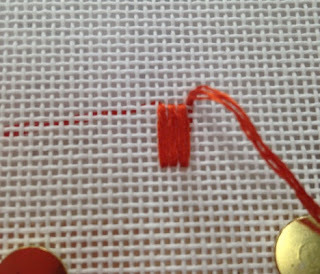 To use, bring the needle from the bottom of the canvas to the top and leave the loop hanging loose on the back. 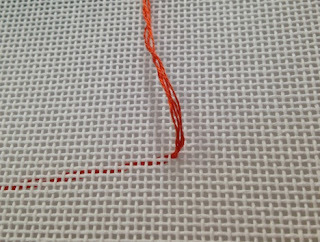 Take a tiny stitch to the back of the canvas, threading it through the center of the loop, and then pull snug. You have anchored your thread and are ready for your regular stitching. 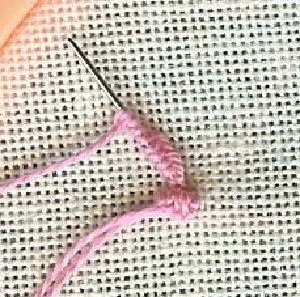 Some people do this with their first stitch and do not do a tiny beginning stitch. I almost always end my threads by running through stitches on the back of my canvas to secure. If I have a nasty thread (for instance slicky that does not want to behave), I use a bargello tuck. While diagram shows going under 2 threads I general would go under many more and then return. These are all the ways I can think of now. 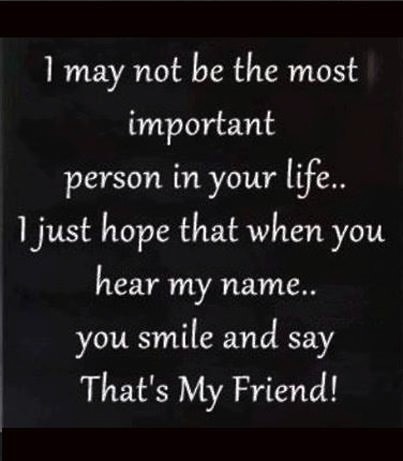 As more come to me I'll try to remember to share them with you later. In the meanwhile, stitch with a smile and have a great day! GLORIOUS SUNDAY MORNING IN CENTRAL KENTUCKY! All you 'sleep ins' are missing a refreshing show of the beautiful sunshine in a clear blue sky sprinkled with wispy white clouds. I'm sitting here with my coffee loving it. 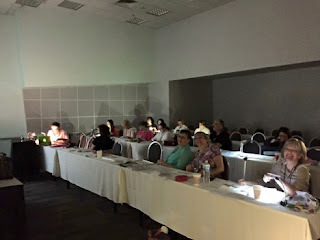 While looking over some of my Online Mystery Classes, the content, questions, comment, lessons, etc., for some reason I decided I wanted to talk a little about laying tools - so it's my blog I'll talk about what I want and here goes. There is a plethora of tools available to us. The Good Lord gave us our first laying tool - our fingers. Now admit it. How many of us, when just working with 2 strands of thread or so, in a small area, depend on our finger to lay the threads? It is easy, you don't have to go find the other laying tools so it is convenient, and it comes with the body if we are blessed - so no added costs. I think there is an impression that we have a 'new' laying tool our there called a quill! New? It is as old if not older than the finger. But granted it has now been fancied up and embellished to be a beautiful addition to our toys that we must all have. The poor ole porcupine won't recognize his own product. These points are very sharp and the tool is very sturdy yet flexible. Other tools that I am experienced with are shown here. After my fingers, one of the first laying tools I had used was the trolley needle. It's that funny little metal thing that is second from the top. 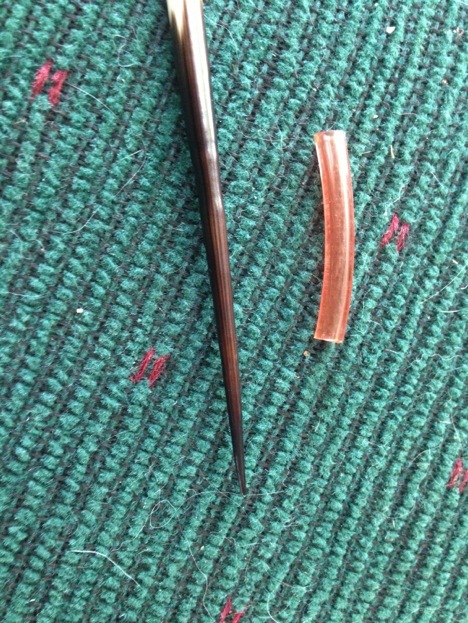 The less expensive ones appear to be a large darning needle welded to a ring type apparatus to fit around your finger. I tried and tried but just couldn't get it to work. I used it just as Lilas of Grip-It told me to and had the video demonstrating its use. But somehow it just was not comfortable for me. Then one day at a market in Nashville many, many years ago when we had INRG, I happened upon a room that had these beautiful pewter trolleys. I chatted with the gentleman who had the booth - lovely British accent - and told him I loved and coveted his beautiful pewter trolley tools - but they just were not comfortable for me. He, in his very gentle British way (cough, cough) informed me that 'you Americans use them all wrong! They are supposed to be worn on the thumb!' So I tried it that way. Hmm, felt pretty good. Then of course I felt free to purchase one since I now felt like I might actually use it. Well, use it I did and I have loved the freedom of wearing it on my thumb ever since. I don't have to drop or change my hand, etc., to lay my threads, it is right there. The very top one is a fancy one that has inlaid wood in the handle. 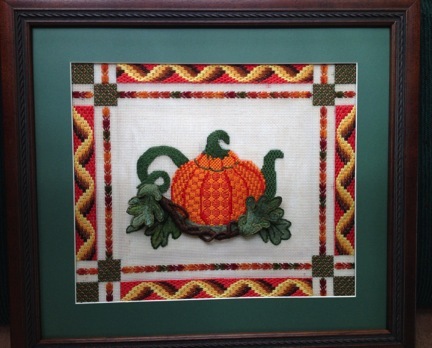 While is it beautifully crafted it spends most of its life in the tool box of my needlepoint treasures. Next is a hair stick that is adorned with beautiful beaded embellishments. The point is not quite as sharp as the others but it was pretty so I added another version to my list. A laying tool that is missing from those above is the fantastic glass one. It is rather pricey (I believe $100+) but it has a lifetime guarantee. Drop it, break it, return it, no questions - as I am told. Sharon G used to swear by this one and even created a needlepoint holder (lanyard type) for us to wear around out necks to protect and store them. This one I'll just have to take everyone's word on its attributes because I have a porcelain floor, I sling and throw things, don't look where I set down my tool 'cause I'm busy looking at where I want to do the next stitch, etc., etc., so I would be breaking one at least on a weekly basis if not daily. Too much inconvenience for me. 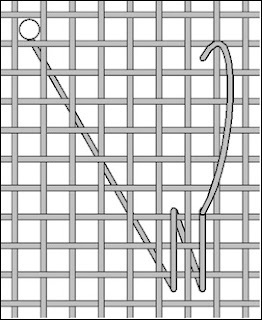 To use the laying tool, I personally, bring my threads to the top of the canvas. I create some slack in the threads I twist my needle to let them fall as naturally as they can by being confined in that tiny little hole enclosure at the end of the needle and squeezed into that little hole in the canvas. Then, depending if I am laying my stitches from the top to the bottom or from the bottom to the top, I lay them on the canvas, pulling the thread more taut at this point. I place the laying tool about a 1/2" or so from the threads entrance through the canvas on top of the thread and hold it flat against my canvas. 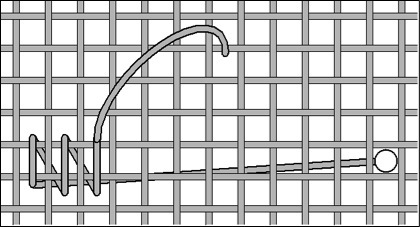 This keeps the threads fairly flat and untwisted. 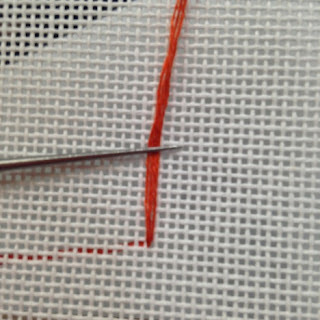 I take my needle and place it through the next canvas hole where I want my stitch to end. I pull the thread through until there are a couple of inches left from my laying tool and this creates a loop. 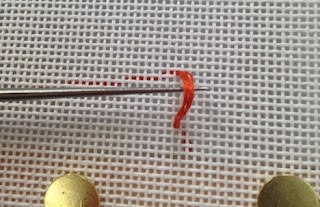 Holding the thread off the canvas (I don't want to rub my thread against the rough canvas finish) I pull the loop tighter and I stroke the threads until the are aligned next to each other - not twisting or laying on top of each other- I then hold the thread against the canvas near the canvas hole to keep the threads aligned, pull the thread, gently lifting the laying tool to permit the thread to move to its final destination. Separate all stranded threads first then put back together. Keep in mind while you are critique my stitches that I am holding a camera with one hand and trying to stitch/hold laying tool, etc., with the other - so it is what it is but you should get the idea! Okay - big failure - I tried to video this process - my hubby held the camera - not too well but not too bad either. Then I saved it and then tried to download it. All I got is this icon of the movie that I thought I inserted but apparently it doesn't work that easily. Oh well, I tried! I'm not giving up though! There are tons of free videos out there demonstrating different ways to use the laying tool (obviously this video isn't one of them) so you should be able to find one that is comfortable for you! Keep looking. This is one of those things that practice will make it become more comfortable for you to the point you just do it without thinking about it. If you ever get the opportunity to take a class with Sandy Rodgers she has a very unique way of handling her threads when laying them - she's a master at it! Last but not least, I will share with you may most favorite laying tool of all ! No, this beautiful bed is not mine - pile all that stuff in the middle, on the floor, etc., then it will look more like mine. Beautiful - yes even a cloudy, gloomy, overcast, rainy breezy day is beautiful to me. I know, shoot me! But, I just happen to be one of those people who loves mornings and am thankful to awaken each morning by the grace of God. So, since I am awake, it is my duty to see how much trouble I can get into, right? I am looking at my 'coffee table' (actually an antique rice bed that is approximately 4' x7' long) that is covered with current projects laid out on stretcher bars. These projects lie there looking at me - no, staring at me - saying, okay lady what are you going to do next to mutilate us? Tee Hee! Little do they know. First on the left is one of the teaching pieces I am finishing for the ANG National Seminar in New Orleans exhibit that must be in Myrtle Beach by mid-July for display of class selections. 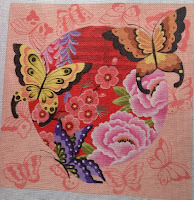 This piece - Papillion - I just 'had' to offer in 3 color choices - one was not enough - noooooo, I had to go an offer 3. So, I, in my infinite wisdom, felt it necessary to show and stitch 3 color choices - was it required? Probably not, but that's just not the way I always see things. 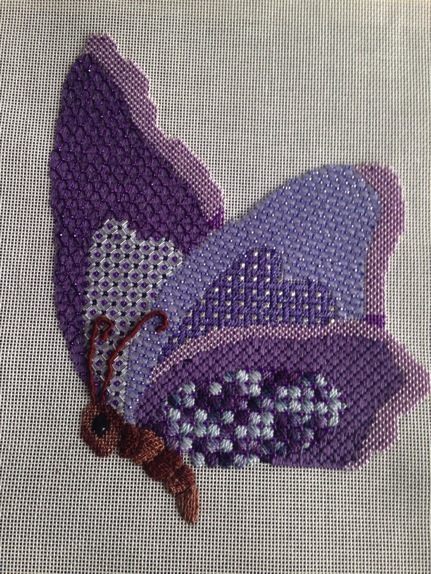 I am currently adding a bazillion beads - love it! She and a an apricot/orange companion are at the finishers to see what they mature into. Next to this cute guy is the elegant Online Mystery Class Beijing Butterflies. Registration is currently going on at duodesignsinc@yahoo.com for this one. Oh my what techniques have I concocted for this beautiful exclusive design from Leigh Designs for us to play with online? These beauties have ribbon, metallics, silks, crystals, beads, etc., etc. And the stitches are unbelievable - weaving, encroaching, buttonhole, layering, knotting, laying, or nue`, who knows? This beauty has all the threads selected and stitches tested so now it is just a matter of finishing the execution! And then there is what is on my floor stand? 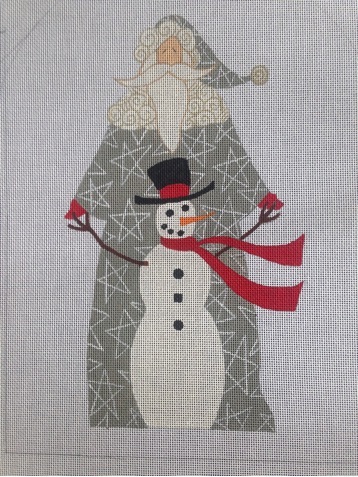 I am sitting here viewing my current WIPs while looking over the stretched on bars new Curtis Boehringer Santa and Snowman that I am stitching and writing a stitch guide for the wonderful Fleur de Paris to be able to distribute to your LNS so you can have as much fun as I am. I designed a special darning pattern background just for these guys and it will be in my Series VI book (yea, I know, Series V needs to get off the shelf first - it's coming, it's coming!). I have to say, though, while I am busily stitching and loving every minute of it, my mind is bursting with the things I want to share with you! There is so much in the 'pipeline' (as we use to say when I had a 'real' job) that I need several sets of arms to get them done. 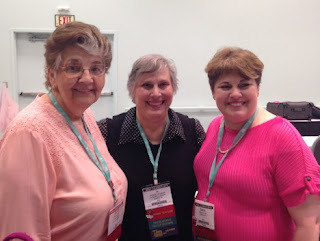 I have ready to place on stretcher bars 3 new, upcoming Online Mystery Classes: Melissa Shirley, Annie Lane (you asked for it) and the Collection. OMG they are all beautiful. Plus I have a very special class that can be worked in between for those of you that are stash hoarders. I will be sharing that one within the next few weeks! Okay, so a few projects are calling my name. I have had a cup of coffee, scanned my emails, did fast check on Facebook, made sure students didn't have burning issues, chatted with you and now I am going for the second cup of coffee and Santa and I are going to enjoy listening to the rain on my skylights and be thankful for my life as it is! SAD - YET - HAPPY! My life is so full of conflicts! Seems everything is a two-edged sword. Somehow, though, we all manage to get through these conflicts and move forward. 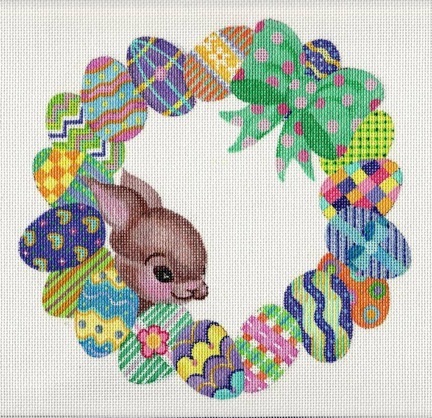 Today's two-edge sword involves the Online Mystery Class EASTER WREATH! It is sad that you only have two days left to register and join us in our adventure. So I wanted to send out this quick little reminder that if you want to be part of the fun be sure to email me at duodesignsinc@yahoo.com and tell me to get you included! The happy edge of that sword is that in less than 4 weeks we get to start stitching on this fun piece. There are 17 eggs that await our embellishment. And look at that bow and then there is the background. But, the little sweetness of this piece is that cute little bunny peeking around. We will be needle felting this guy and every one will have its own little personality. So, if you are so inclined, be sure to drop me a quick email so I can still get you registered in time to go on this journey with us! In the meanwhile, I am heading to Ikea today! We don't have one locally but my hubby is driving me up so I can stitch as we go. Yes, even though I travel I still stitch! So have a great day and remember to stitch with a smile! 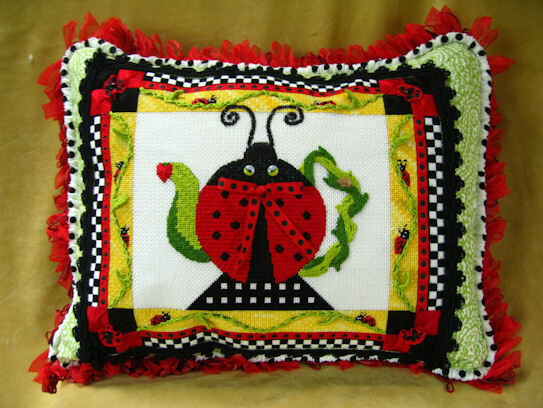 I am amazed when I see someone post that they have finished a project and have no idea where to begin looking for a new project to start, or where to purchase a canvas, get assistance, find threads, etc. I know that it can be rather intimidating for a beginning stitcher, but in this day and age with the Internet search capabilities, it should be relatively easy for someone to find these resources within a certain geographical range of their home base. BUT, for those who don't want to wander out, or who cannot do so, because of various personal reasons - the hour of the day when they have that window for self-playing, mobility issues, transportation issues, etc., we have a partial answer. ONLINE MYSTERY CLASSES! Those of you who follow me know that I am having a ball and I think most of my students enjoy the adventure as well. As we hit the halfway mark of the current class, HARVEST, we are gearing up to begin the next new adventure of EASTER WREATH. Those signed up should have ordered their canvases by now and probably are gathering up their threads and materials list. The posting of Lesson 1 for this class is scheduled for mid-July! Not that far away. (Yes, you can still register by contacting me at duodesignsinc@yahoo.com.) Scroll down through earlier postings for more details on this canvas. So while we are comfortable with knowing that everything is set up and ready to go for this fun canvas, from this end, we can now begin concentrating on the next class for those seeking a differently themed adventure. We have an exclusive design for Duo Designs, Inc., painted by Leigh Designs. Beijing Butterflies is filled with different technique and thread/material possibilities. This 10" x 10" design on a cut 18ct canvas of 14" x 14" is very elegant. We are going to be working with ribbon, beads, crystals, silks, metallics and more. We will split, buttonhole, weave, bargello, or nue` and who knows what else? This class is made up of 6 online lessons posted monthly to a secret Facebook Page that only members can access. The 6 lessons are invoiced through PayPal for a 6-lesson packet of $150. Participants may pay through PayPal or send personal checks. Once the payment is processed, the participant will receive an invitation to join the secret Facebook Page and they need to accept this invitation in order to receive the lessons. But better yet, you will get to enjoy the ongoing discussions that add so much more to the classes. 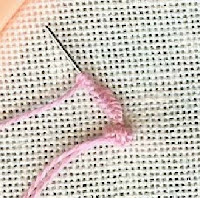 Note: Lessons posted on the Online Mystery Classes are much more in-depth than are the published commercial stitch guides. 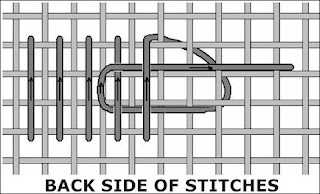 Online we have the freedom to post many more work-in-progress photos, etc., than space allows to provide an economically priced commercial stitch guide. And participants share their progress and questions as well. Registration is now open for Beijing Butterflies. To register simply send and email to duodesignsinc@yahoo.com and provide a viable email address for communication. The exclusive canvases must be ordered through The Needle Works, Austin, TX. The canvas can only be purchased by individuals registered for this class. Resources for select shops that will be providing thread kits (when completed) for those interested will be posted in the secret Facebook Page. The first lesson will be posted mid-August. Won't you come join us? It will be a fantastic journey: you'll learn different techniques and approaches to canvas areas and you're guaranteed to add new friends and acquaintances that share the same passion that is dear to all of us! In the meantime, remember to stitch with a smile! Another summer market has come and gone but with it are new memories and new acquaintances! This year was really weird for me - just when you think you've seen it all something new happens on the teaching end. I taught two classes on Thursday before Market started. While sitting in my hotel room my phone rings at 12:01 and it is a friend who (or is that whom?) I was expecting to be in town that day for the market. She says 'Hi, where are you?' And I say, "Hi, I'm in my hotel room. Glad you made it. Where are you." And she says, 'In your classroom waiting for you to teach!" NO WAY! I am thinking my class doesn't start until 12:30 but obviously it started at 12:00. Needless to say that was the fastest half-mile walk this ole gal did pulling two suitcases of class kits that I never want to experience again! I have never been late for class so it goes to show you there is always a first. Fortunately the majority of the class were those who have taken many classes from me before and they knew it was not like me to be late. I'm always the first one there, set up, ready to go. So that was a hairy start to my weekend. 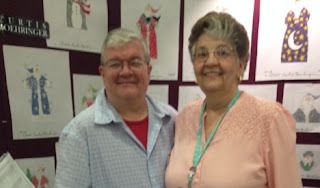 After class I had been invited to dinner by one of the students and her husband to discuss some needlepoint scenarios. Jo Christensen, who was in the class, was invited to dinner also. Oh my gosh! What a hoot! We had the most fun. Jo and I just enjoyed our dinner and were totally entertained by Deanne and her husband. We loved every minute of it. Friday was a free day for me because the only market classes are business classes and I quit doing that years ago when it was INRG - LOL. 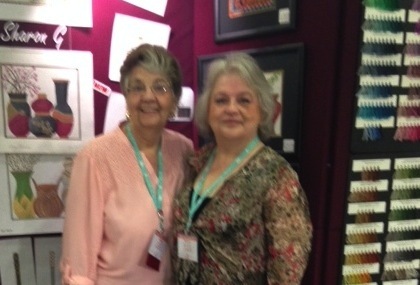 But, my friends from Louisville, Barbara and Cheryl let me tag along to their shop hopping adventures. We went to What's the Point? and there we visited (and interrupted) Carolyn Baird's class but it was good to see her and some of my other friends as well. We also managed to spend some money! From there we went to Louise's and visited and there I ran into Mary Smith (the Parliamentarian) in her cute little Columbus Zoo uniform. It was fun visiting with her. I can't believe we did not take any pictures. We were too busy spending money! Friday night's showcase is always fun because I get to see my models displayed by the designers showcasing their new designs for the Summer Market. 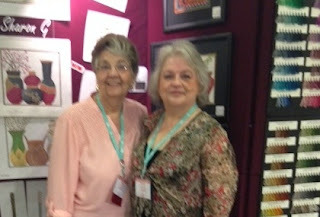 This year Leigh Designs had my Hollywood in her Gold Digger Line, Juli Poitras of JP Needlepoint had my The Black Queen in her owl series, and Susan Roberts had the cute Flower Sampler that had tons of techniques. Friday night was a semi-ritual where I (or Bill and I when he is with me) have dinner and visit with Leigh and Robert Richardson. This time we were joined by Sally London of Rainbow Gallery and Sandy Rodgers of the new products column of Needle Pointers magazine. Saturday morning was back to business and class. Guess who was early, all setup and ready to go by 7:00 a.m.? ME! (Class didn't start until 7:45 a.m. thank you very much!) Albeit that they had not turned on the lights yet but I used my iPhone flash light to assist where I needed extra light. Little did I know that there were no lights on the entire floor! Only one classroom had lighting. Well, never fear, we will move forward. I began by demonstrating on the overhead how to do a couple techniques before we would move out into the hall where there was light. However, by the time I finished the demonstrations - voila! - the lights came on and we were able to proceed. Sharon Garmize hasn't been to the shows for a couple of years and it was good to see her active at market again. Curtis Boehringer who is distributed by Fleur de Paris. Fleur has commissioned me to do some stitch guides for his pieces. Look forward to the challenge! Pieces were confirmed for the Winter Market and new lineups for the Summer 2016 Market were made. I am excited to add the fairly 'new kid on the block' Melissa Prince to my wonderful bunch of designers. Wait until you see what she and the others have to offer us for future stash enhancing! 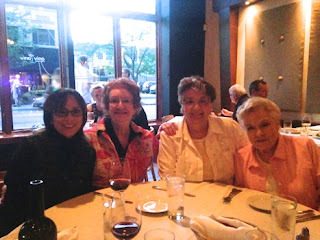 Saturday night involved the Designers/Teachers Meeting and a planned dinner with Jo Christensen and Sandy Rodgers. By now we are dragging so we decided to just have dinner and a long, quiet visit in the hotel restaurant. While market is said to have had a low attendance I understand that those who attended were buyers and all in all it was a positive experience. I also picked up from conversations that many are looking forward to next year in DC in anticipation of a much larger market. For me, I went to the market floor on Sunday and said my goodbyes and headed home. It was a semi-pleasant drive home as it rained from Columbus to Cincinnati. By Cincinnati it had cleared and I was able to visit my thoughts and rehash events that had occurred over the past several days. All in all it was a great experience as usual. Now, I must get back to the normal grind of things and stitch, design, stitch, write stitch guides, and stitch, which I love and I do with a smile! Till next time, you too, remember to stitch with a smile. Now that early registration is over, etc., it has been confirmed that my classes are a go at the upcoming EGA National Seminar being held in fantastic San Antonio, TX. I will be teaching two 2-day classes at this year's venue. One is a new piece, Pumpkin Spiced Tea. This wonderful piece has the smell of fall in the air. The colors of autumn abound. The canvas size is 14" x 16" on 13ct canvas. Luscious threads such as Gloriana, Pepper Pot, Rainbow Gallery, Vineyard Silk and Burmilana, to name a few, will glide through your fingers while executing such interesting stitches as a bargello wave, Scotch stitches, balloon variations, cashmere, and many, many more. The excitement of needle felting on needlework is a great technique where we will be using the fantastic Painter's Thread silk roving and tools specific to the technique. The second 2-day class is a self-finishing ornament entitled Diamonds and Rubies. The student will have a choice of one of three color ways: red; blue; or, gold. The piece is stitched on 18ct canvas 8" x 12". Wonderful metallics, beads and ribbons will add to our adventure. 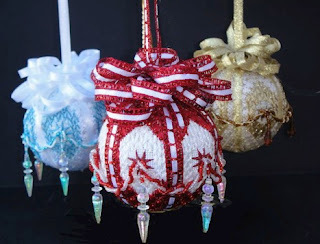 An in-class demonstration will be done for watching the assembly of the ornament for when you return home. 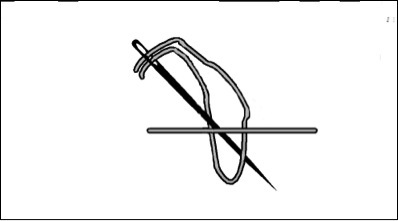 Stitches include crescent variation, diagonal tent stitch, upright Gobelin, slanted Gobelin, interrupted pavilion, twisted bead rope and beaded fringe creation, and bead attachment. 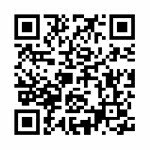 Registration is open so be sure to visit the EGA website - egausa.org and go to Events - National Seminars and review the classes and registrations steps. I would love to have you join me for my classes. Hope to see you there! While at market this weekend I was looking around to check out any new gadgets for us to play with. 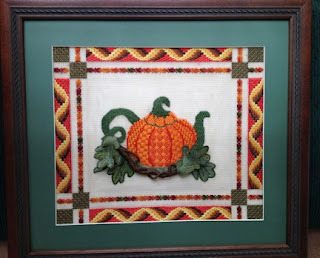 However, a recent section covered in my current Online Mystery Class - HARVEST (scroll down through older postings for more information on the Online Mystery Classes) reminded me that not everyone is aware of a recent item that was introduced by Colonial Needle. We have had bullion needles for decades. No secret. But, to my knowledge, they have always been sharps as used by the Brazilian Embroidery artists (whom I envy for their skills of thread manipulation)! And as you know in our concentration of executing our wonderful art, we tend to 'stick' ourselves if the needle gets to sharp. Add the awkwardness of the length of this wonderful tool and we are in big trouble. Well, Colonial Needle has come to the rescue! They have come forward with the wonderful Bullion Tapestry Points - Item #CB-BN-735B. These needles are packaged in sets of 3 Needles: 3-1/2", 5" and 7" (which is really long). 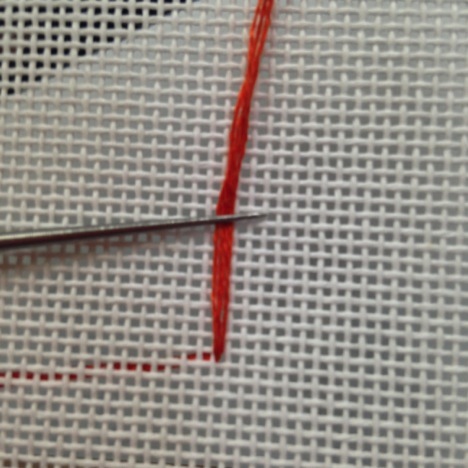 I tend to use mostly the 3-1/2" length needle for my purposes on needlepoint projects. 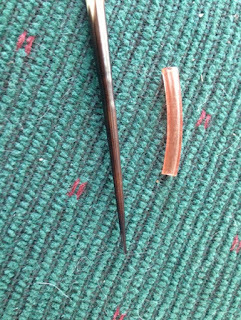 This needle affords us the luxury of being blunt so it finds the canvas hole cleanly, it is long enough to hold comfortably while executing a multi-wrapped stitch, and it also has a decent size needle eye for threading such things as pearl cotton. Some of my students have either never made a bullion knot or have suffered unsuccessful results trying them in the past. Once we got the word out about these needles, we created some bullion creating masters! They are not competing for such titles as 'bullion queen', 'bullion princess', etc. 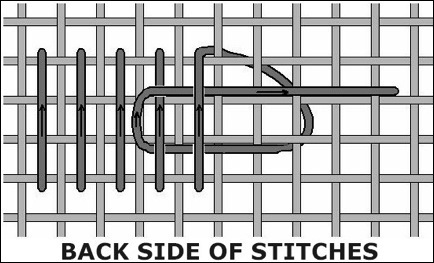 So next time you need to execute the bullion stitch keep in mind that the proper tool can make all the difference between success and failure. And remember that these needles work for the cast on stitches, double cast on, and drizzle, to name a few. 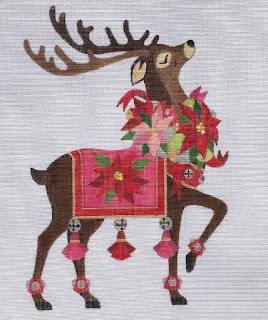 Also, for those who like to split canvas threads in their stitching or who are using a fabric other than needlepoint canvas, this wonderful product is available in sharps as well. 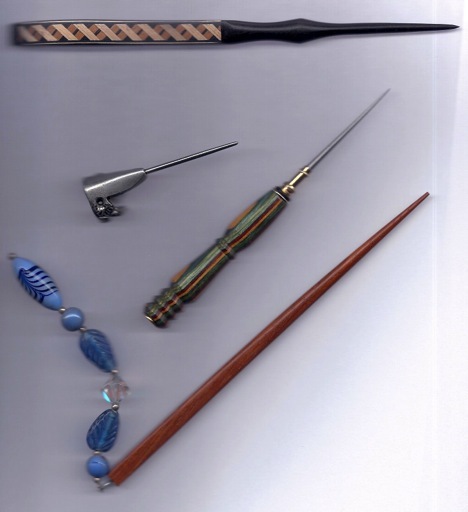 Do yourself a favor and add this set of needles to your needlepoint arsenal! You won't be sorry! 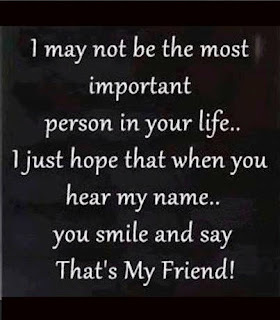 And since it is raining here in Central Kentucky and am going to spend the most of my day sitting here stitching with a smile! Please join me!